I was looking in my family tree at my 4th Great-Grandfather’s line: Sylvanus Brundage (1774-1832) and his wife Elizabeth (1780-1850). They lived in Mount Pleasant, Westchester County, New York. Finding information about him and his descendants has been difficult. Over the years, I have found there has been nothing compiled on this family line on FamilySearch, Ancestry, etc. So today I decided to dig a little deeper into this part of the family tree, and searched GenealogyBank’s Historical Newspaper Archives. I started looking at their daughter Mary M. Brundage (1797- ). I found that she had married Stephen Acker (1800-1871), and by looking at the 1830 through 1870 census records I found two of their children. I felt like I had a good handle on this family. I next found Stephen Acker’s probate records and added that information to my list of sources – but before I finished adding it, I decided to look at the probate paperwork to see what clues it held. Stephen had died intestate, and the paperwork noted that “Willet A. Cronk, son-in-law of Stephen Acker” was named the executor of his estate. Wait, Willet A. Cronk – who is he? I had one daughter of Stephen and Mary (Brundage) Acker, Cornelia Acker (1838-1885), and she had married Nathaniel Eckert (1834-1914) and not Willet A. Cronk. 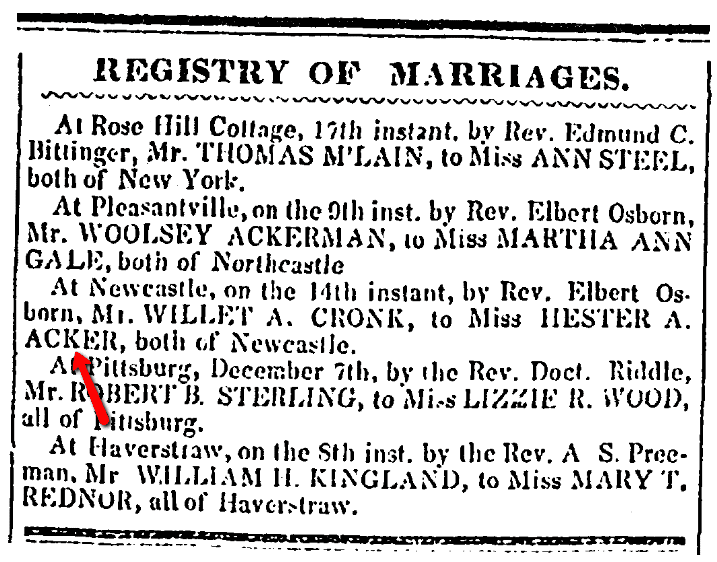 Who in the family did Willet A. Cronk (1826- ) marry? Turning to GenealogyBank, I found out. I see. The undiscovered daughter was Hester A. Acker, and she married Willet A. Cronk in January 1849. So, that is why I didn’t find her listed in the home of Stephen & Elizabeth Acker in the 1850, 1860, etc., census records. Looking more at the Acker family, I found that Stephen’s father was Deliverance Acker and the family line extended back to Wolfert Acker (1667-1753). Turning back to GenealogyBank, I found this article about Wolfert Acker. 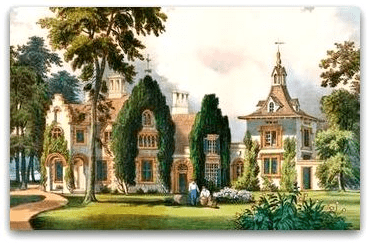 It turns out that this was the Wolfert Acker who built his home in Tarrytown, New York – better known to most of us as Sleepy Hollow. 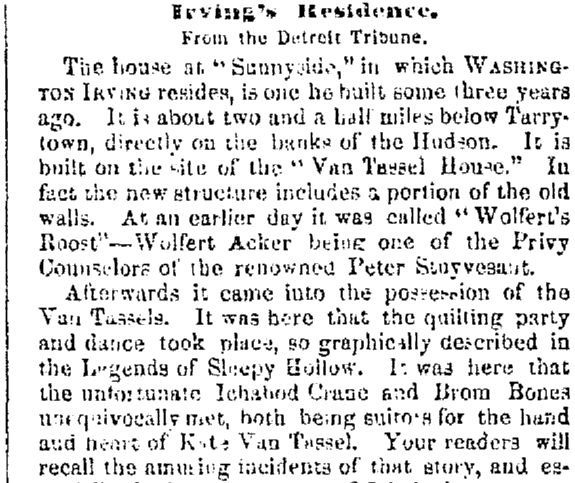 A century later, the property was sold to author Washington Irving, who expanded the house and named it Sunnyside. Illustration: Currier and Ives print “Sunnyside,” the home of author Washington Irving, in Tarrytown, New York, c. 1860. Credit: New York Public Library Digital Collection; Wikimedia Commons. Genealogy Tip: As you research and gather your family history, be sure to search GenealogyBank’s old newspaper archive to find the details of their births and marriages – and the stories of your ancestors’ lives.